Confronting footage has surfaced of Tammy Hembrow passed out asleep at the Coachella music festival in Indio, California over the weekend. A video posted to Instagram by LA-based musician Mitch appears to show Tammy, 24, slumped over in a chair and snoring as she rests her head on her right knee. The footage, which Mitch has since deleted, later went viral after it was reposted to the Brown Cardigan Instagram account on Monday morning. 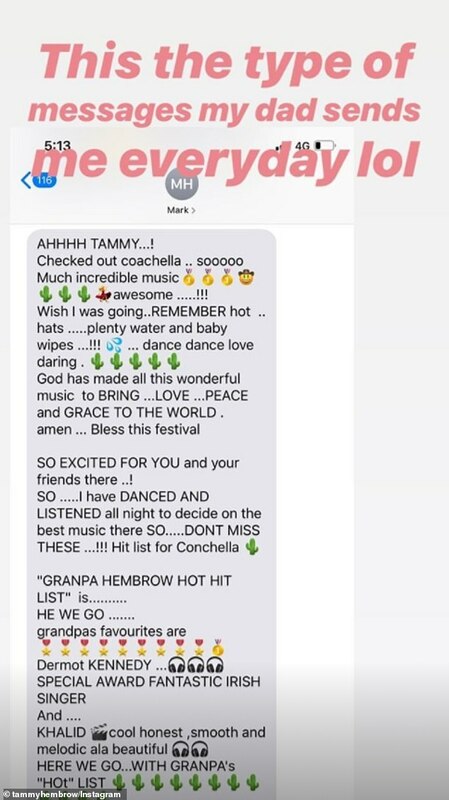 The video was captioned: ‘Coachella was too lit for tamtam’. 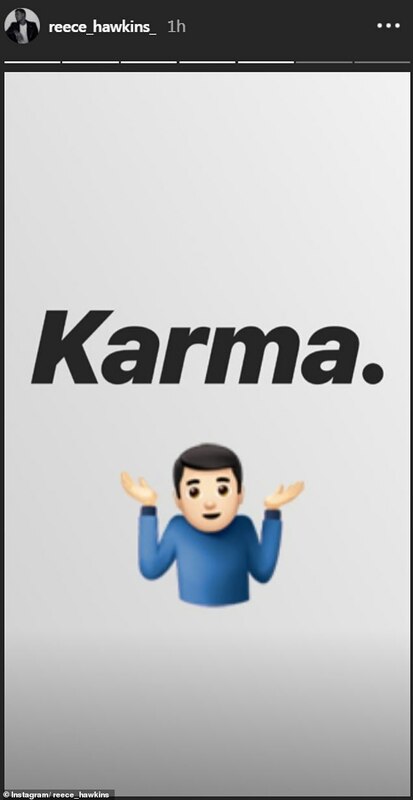 After the video was widely circulated on social media, Tammy’s ex-fiancé Reece Hawkins shared a post to Instagram that read: ‘Karma’. Daily Mail Australia has contacted Tammy’s sister and spokeswoman, Amy Hembrow, for comment. The footage emerged just days after Tammy spoke of her excitement at attending Coachella for the first time. On Friday, she shared a lengthy text message her father Mark Hembrow had sent her, telling her to drink plenty of water at the festival. While on her way to the event, a friend of Tammy’s also revealed on Instagram that she was recovering from a broken ankle. ‘Tammy’s literally got a broken ankle, so she’s going to Coachella on crutches!’ the friend could be heard saying off-camera. It comes after Tammy was infamously stretchered out of Kylie Jenner’s 21st birthday party in West Hollywood in August last year. 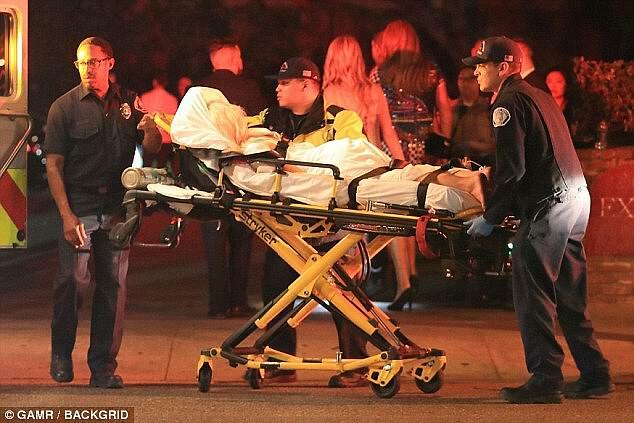 The mother-of-two was pictured being wheeled out of the Delilah nightclub on Santa Monica Boulevard strapped face down on a gurney. She was loaded into the back of an ambulance and rushed to a nearby hospital. Following the incident, Tammy returned to Australia and addressed what happened in an emotional YouTube video. Wiping away tears, she revealed she felt ‘super embarrassed’ by her hospital dash and pleaded with trolls to stop ‘being nasty’. ‘Firstly I want everyone to know that I’m OK… So yeah I pretty much collapsed. Honestly I’m already like super super embarrassed about it,’ she said. ‘I probably, definitely shouldn’t have been drinking because of how jet-lagged and exhausted I was and I already wasn’t feeling well. Tammy is a model and businesswoman from Queensland’s Gold Coast, best known for being the founder of activewear label Saski Collection. She shares two children, son Wolf and daughter Saskia, with her ex-fiancé, Australian streetwear designer Reece Hawkins. In addition to her business ventures, she is a popular social media influencer with 9.4 million Instagram followers and 1.3 million subscribers on YouTube.